BORN: 1834 in Laurel, IN. DIED: 1896 in Columbia, TN. Francis Asbury Shoup was born in Laurel, Indiana, on March 22, 1834. He was the oldest of nine children, and graduated from West Point in 1855. Assigned to the 1st US Artillery, he fought against Seminoles in Florida, then resigned to practice law. He led a militia unit in Indiana, but returned to Florida because of his "aristocratic inclinations and admiration for the South." He passed the bar in St. Augustine, and began offering his services to the governor when the Civil War began. Shoup joined the Confederate military, and served at Shiloh, for which service he was promoted to brigadier general as of September 12, 1862. He also fought at Prairie Grove, Arkansas; Mobile, Alabama; and Vicksburg, Mississippi , where he was captured when the city fell to the Union. After he was paroled, he served as artillery chief during the Georgia campaigning of 1864, and supervised the construction of the defensive works along the Chattahoochee River. He later promoted the recruitment of black soldiers for the Confederacy, and served as Gen. John B. Hood's chief of staff. 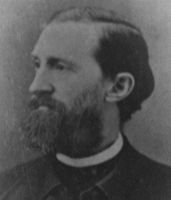 After the Civil War began, he worked as an Episcopal rector, and became a faculty member at the University of Mississippi and the University of the South. During the war, he had written texts on infantry and artillery drill; after the war, he wrote about mathematics and metaphysics. Shoup died on September 4, 1896, in Columbia, Tennessee.